Very tasty sausage scramble for morning breakfast.Can be done in 15 mins cooking time .Best done with fresh sausages than with the frozen sausages and best taken with Berry-Berry Smoothie. Try at home and enjoy!. Heat 2 tsp oil in a kadai and saute the sausage pieces for a min. Add chilli powder, ajwain,nutmeg powder and dry ginger powder and saute this for 5 mins at-least on medium flame. Heat 2 tsp oil and add curry leaves and the beaten eggs and scramble well for 3 mins on medium flame.Add green chilli paste,ginger-garlic paste and few coriander leaves.Saute for 3 mins. 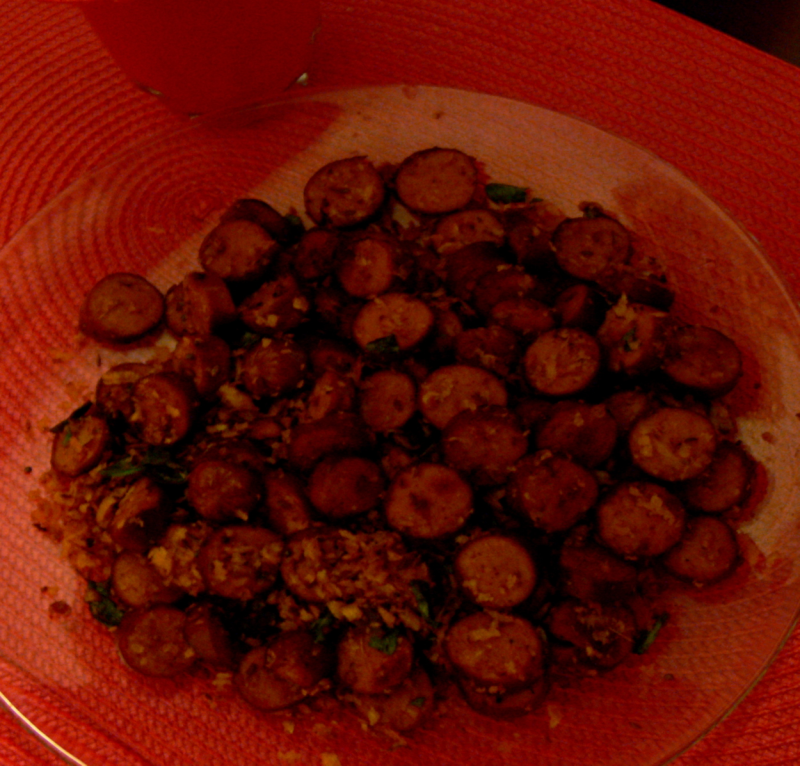 Add grated coconut and fried sausages and saute for another 3 mins. Best served with Berry-Berry Smoothie. Hi Shinchi,thanks a lot for ur feedback. Cool recipe and interesting I love anything with sausages. Hello Mrs.Syed,Thank u so much for ur appreciation. hi christy...ur dishes r really ethnic,havin an indian touch in all of thm....am tryin many of ur recipes n results r mostly xcellent...thank u!!! Hi Rabz,amazed by ur quick feedback.Thanks a lot.Bye. VERY NICE CHRISTY, NEVER THOUGHT U CAN MAKE SAUSAGE IN AN INDIAN MANNER. I WILL GIVE IT A TRY & SEE WAT IT'S LIKE.